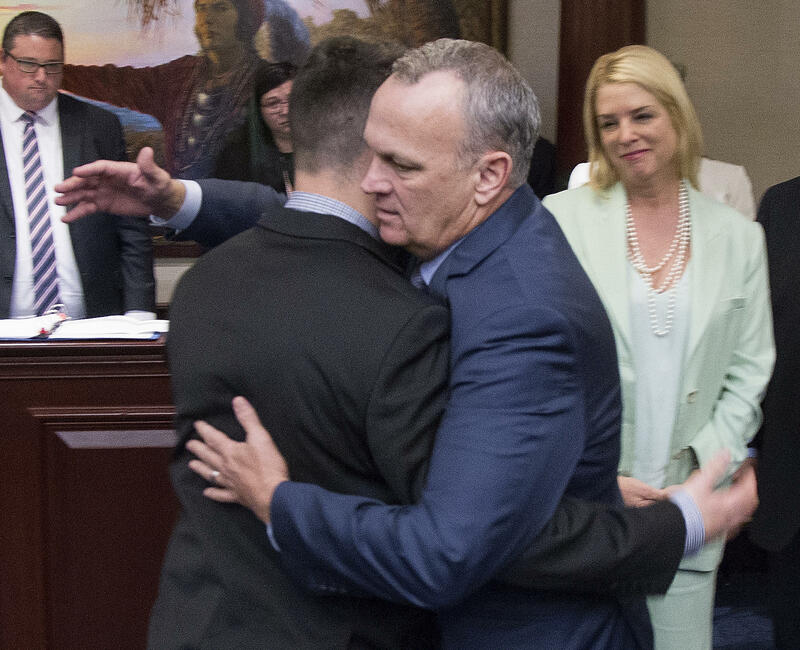 Florida Speaker of the House Richard Corcoran (center) hugs Hunter Pollack, whose sister was one of the 17 people killed last month in a mass shooting at a South Florida high school. The state House on Wednesday passed a package of measures intended to prevent another school shooting, sending the bill to the governor for his approval. 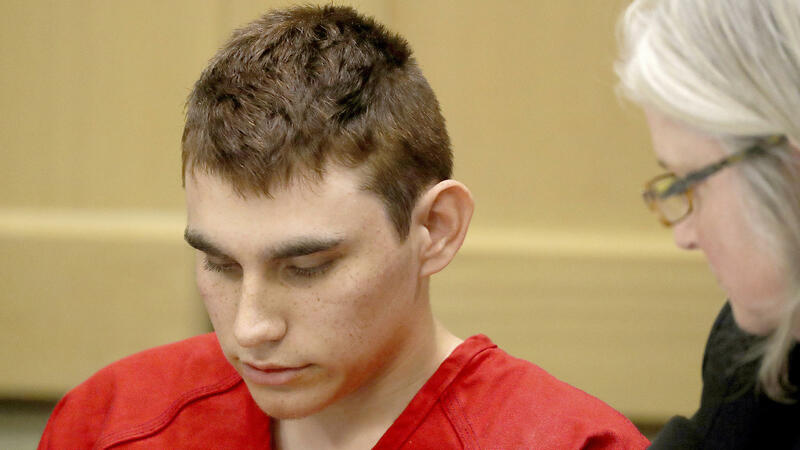 Nikolas Cruz, 19, shown here in court on Feb. 19, has been indicted on 17 counts of first-degree murder. If convicted, he could face a death sentence. The vote reflected a mix of support and opposition from both Republicans and Democrats, and GOP Gov. Rick Scott has not indicated whether he will sign it, the Associated Press reports. Earlier in the day, a grand jury in Fort Lauderdale formally charged Nikolas Cruz, the suspect in the deadly school shooting in Parkland, with 17 counts of first-degree murder. The indictment, announced by the office of Michael Satz, the Florida state attorney for Broward County, also included 17 counts of attempted murder. Cruz, 19, is accused of carrying out the Valentine's Day rampage at Stoneman Douglas High, where 17 students and staff died and at least a dozen more were injured. According to Florida law, if Cruz is convicted of first-degree murder, prosecutors could seek the death penalty, although the Broward County prosecutors have not announced a decision on this matter. Cruz is being held without bond. The grand jury indictment comes on the same day Education Secretary Betsy DeVos met with students and faculty at the school. Her visit coincided with the return of the first full-day class schedule since the shooting took place. The visit was closed to the press "out of respect for the students and faculty," according to a press release announcing her visit. At a news conference afterward, DeVos described her time there as "a sobering and inspiring moment and visit." DeVos also defended the idea of allowing some teachers to carry concealed weapons on school grounds, something President Trump signaled support for in the days following the shooting. "Let's be clear, I think to say arming teachers is an oversimplification and a mischaracterization really," DeVos said. "I think the concept is for those schools and those communities that opt to do this ... to have people who are expert in being able to defend and having lots and lots of training in order to do so." DeVos highlighted a program in Polk County, Fla., that trains and arms teachers to respond to a would-be attacker, including a potential gunman. According to the Orlando Sentinel, the program run by Polk County Sheriff Grady Judd allows teachers or professors who "volunteer for the training [to] go through a certification program that would be more stringent than even those police officers go through." Arming teachers was a major point of contention in the debate over gun safety measures before the Florida Legislature. On Monday, Florida's Republican-controlled Senate narrowly passed a package of gun control measures, aimed at preventing rampages like the one at Stoneman Douglas. As NPR reported, the measure passed the Senate by a 20-18 vote and raises the age requirements in the state to purchase a firearm from 18 to 21, bans bump stocks and imposes a three-day waiting period to buy any gun. Also included in that bill was an opt-in provision to allow some teachers and school staff to carry guns in the classroom, but it excludes those who "exclusively perform classroom duties as classroom teachers." Families of the shooting victims wrote a letter to the legislative body on Tuesday, urging them to pass the gun package. While Cruz awaits trial, Robert Runcie, the superintendent of Broward County Public Schools, has ordered an independent review of his "educational journey" through the school system, including his academic records and the social and emotional services he received from county officials. Runcie expects the review to take six to eight weeks and cost around $60,000.